Monty i think its a great idea and would vote for it for sure. So EZjack, DeeK, Killa, PK, Fire, OG, Nekkid, crane, leatherface, hell even DiePlz and any other regulars .. what say you sir(s)? If the mighty Slot would theoretically be willing to facilitate such a change on Shmack would you be interested in playing the occasional custom map just for a bit of fun to keep it fresh? So long as the majority of folks want it, I have no problem enabling custom maps for voting (or rotation). I would love to see come custom maps for RQ. It would change things up and maybe even draw some new players in. Thanks Pie. As always, nice to see you. I did mention it to Polarite some time ago but it we never agreed on the format. Personally, I thought the first one was fun for most people and worked out reasonably well. Dee suggested perhaps a form of 1v1 knockout format might be fun but I never got any support for it from enough of the other players. The bottom line is we just want to facilitate a fun, friendly event that people will want to attend. Just out of interest, and not wishing to derail the thread but what format would you like to see? 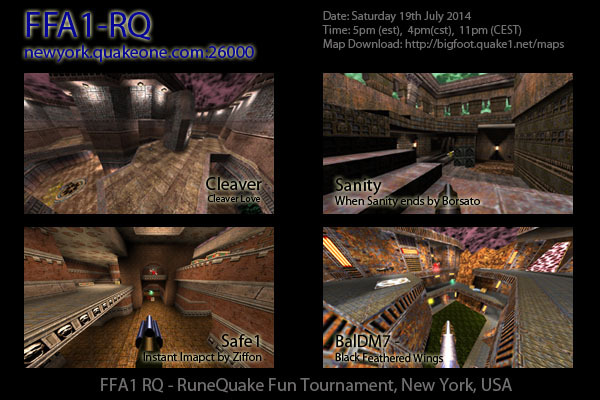 I would love to see any format for RQ tournament because I had so much fun and there was such a great turn out for RQFFA1. Dee did tell me that he would like to see a 1v1 knockout style, but I feel like that format is exclusive to some players that don't play as often or are newer to the mod, as they won't be able to participate after being eliminated. Thanks for the support SPF ..Custom maps for the win ....hopefully But I would suggest purely as votable rather than in the rotation. I just looked at some of the footage from the last one and you're right it did look a lot of fun. We were planning to have a 2nd tourny around Halloween 2016 as it seemed appropriate for Quake but as is so often the case real life got in the way. I'm working away at a clients premises during the week this week but I will try and fine a little time when I get back this weekend to talk with Pol (unless he picks up this thread first of course). As before, I'll post all the details of the outcome of those discussions on the Damage site (http://bigfoot.quake1.net/), and cc to here and Quakeone.com. I am wondering are we going to do this or not? It is able to be voted on so it shouldnt be a problem yes/no? The custom maps that is. How are we going to determine which maps, and how should new players obtain them? I know some clients have automatic downloading, but not all. 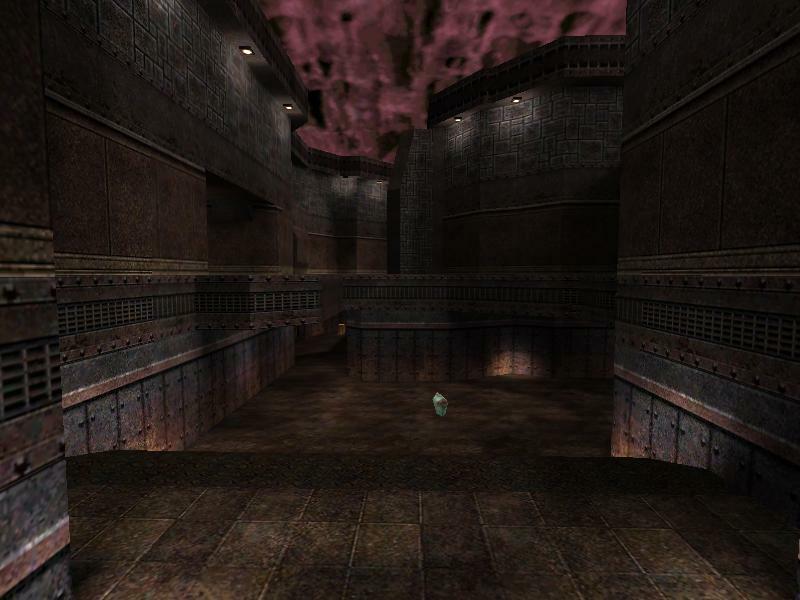 My humble suggestion would be introduce a few of the more popular custom maps that most players would probably already have and provide links for those who need them (i.e. those who don't have the auto-download feature available to them). Ideally they would be voteable but not on the normal rotation. This is just my humble suggestion to get things started so feel free to add / change / remove / point and laugh as the majority of the community sees fit. comment from any other players . I thank you for attempting to change it up some. Sorry, been busy dealing with family....Monty I'm in 100%, thanks for putting out the effort! Would be a nice change really, as the same old maps are getting a little boring, again thanks for trying to get this together and I look forward to the new maps!!! Thanks Jack I agree ....soooooooo Slot what will it take from us to get this done? Along the way, time to take start, dm4, dm6 and e1m7 out of the rotation, and turn off voting for them. That garbage has been played absolutely to death. I am just wondering where we are with this.....? Type 'custom' in the console to see the list of available maps. Vote for them as you would any map. Slot I want to thank you for helping us with this it is appreciated for sure. Monty thank you for putting it forward ! I also want to thank Jack, Sprax and Gem for helping as well.